Many of the most successful entrepreneurs credit their success to having mentors or advisors who provided inspiration and problem solving during critical moments of their careers. It has been said that every entrepreneur needs a mentor, but often times the challenge is how to find and choose one. At SXSW 2016, I learned about a new company that is making it easier to find the mentors, advisors, and advice you need to grow your business. Chris Hone is the Cofounder of TurtleWise, a social advice site which he says is designed to bridge the gap between crowdsourced Q&A sites (think Quora) and advice from your family and friends (think Facebook). The TurtleWise slogan is “Get advice. Give advice. Change the World!” To learn more about this new tool for business owners, watch the interview below. By filling out a profile, you’ll be able to share information about yourself, including some demographics and the areas where you would like to give or receive advice. After that, it’s time to ask your question. What is great about TurtleWise is that you can get answers from a specific group of advisors that YOU define. After you submit your question, you can choose the sort of people who you want answers from, including selecting age range, gender, education level, location, and more. This process allows you to get information from the specific advisors that you need. Get the #biz advice you need from the people you want it from. Check out how @TurtleWise can help. Turtlewise is a free service, and you can request an invitation here. However, they also have a premium service that allows you to connect with advisors at a deeper level. Say, for example, that you received an excellent answer from a specific advisor. You can use the premium service to chat live with that advisor in order to dig deeper into their advice. Chris says that, ultimately, entrepreneurs and business owners could use the site to create a group of trusted advisors to turn to as they navigate various challenges and grow their businesses. 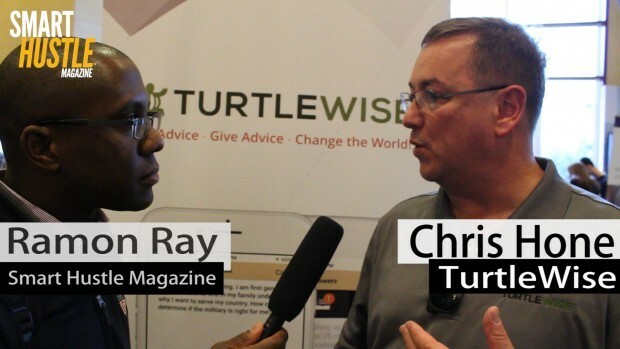 I encourage you to listen to this short interview to learn more about Turtlewise and the importance of having mentors. Near the end, I asked Chris his advice for other budding entrepreneurs. He says, “If you’ve got a dream that you’re passionate about, then go ahead and follow that dream.” Of course, it will take more than passion for reaching that dream, a lot of hard work and a healthy dose of hustle, but if you partner with the right mentors and advisors, you can work through the challenges and find success.